Stimulus : an action which evokes a specific functional reaction in living tissue. The statements and concepts about exercise, put forth on this page are derived from my personal conclusions as well as continually observing the changes in my own physique, my clients and friends who follow a similar exercise strategy. The crucial part of Metabolic Exercise is to engage in 100% physical effort for the purpose of momentarily activating our fight or flight response. Fight or flight : the instinctive physiological response to a threatening situation, which readies one either to resist forcibly or to run away. A gazelle runs away from a predator, because it has an inherent instinct to survive. During an escape, it’s body automatically goes into fight or flight mode, meaning that most of it’s energy is directed to the muscles for maximum output to run as fast as possible. The gazelle activates it’s fight or flight response by engaging in 100% physical effort. 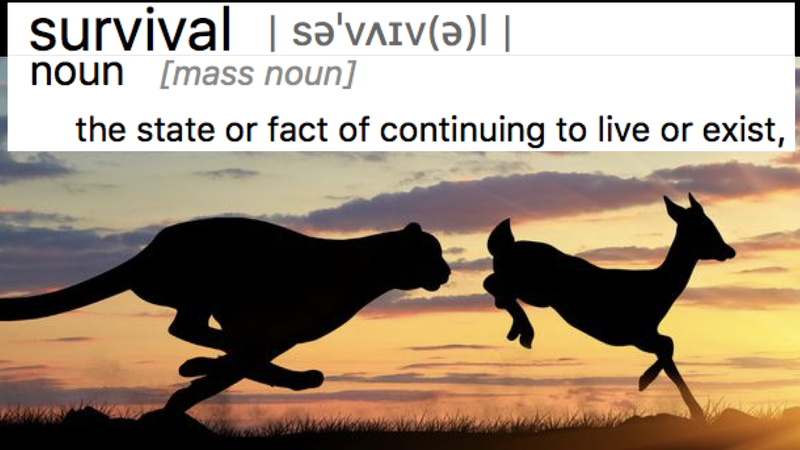 As humans, we have the same inbuilt instinct to survive, and if we find ourselves being chased by a predator, our fight or flight response will activate, exactly like a gazelle. Should we be fortunate enough to escape and survive, our body has now been stimulated to start making adaptations, in order to run even faster, if and when confronted with another predator in the future. Adaptations : the process of change by which an organism or species becomes better suited to its environment. Taking the principle of adaptation and applying it specifically to create a stimulus, which will encourage our body to increase or at the very least conserve our muscle tissue while reducing body fat, is the aim of Metabolic Performance Exercise. Such a stimulus is created and applied by Safe Continuous Muscle Loading, defined as your muscles being forced to work in one continues motion against resistance. The exercise is only brought to a halt as you reach complete muscle fatigue, which is the point where you are unable to move the weight any further. This will ‘send a message’ to your body, that more strength is needed, should the situation re-occur. In other words, you have just stimulated your body to increase and maintain muscle mass because that is the tissue needed for more strength, while at the same time, stimulating it to bring down or keep body fat to a minimum, as fat tissue only slows you down in a survival situation. 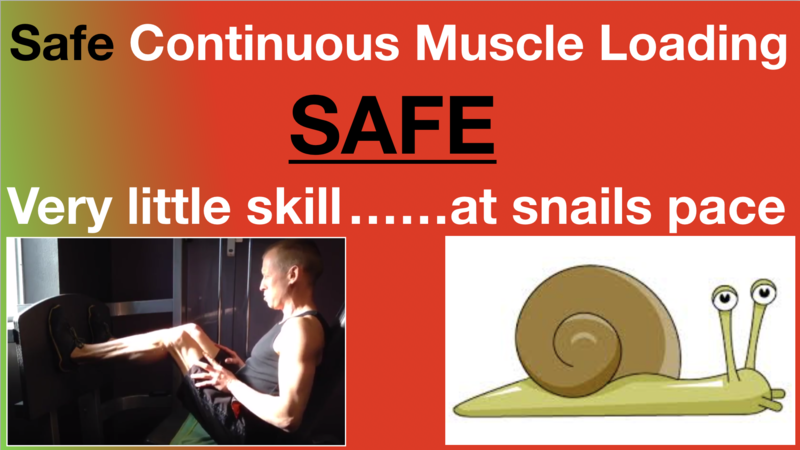 Safe Continuous Muscle Loading, is designed to keep you from getting injured. By using exercise machines, very little skill is required for the execution of any particular movement and removes all risk of being ‘crushed’ by the weight, as you reach fatigue. Every movement is done at snails pace to ensure, that as you approach complete fatigue, the force upon your joints is at the lowest level possible, to further minimise the possibility of injury. The Big Four workout is the way in which Metabolic Performance Exercise is implemented on a day to day basis. Measuring progress with this kind of training is done by what is termed Time Under Load (TUL), which is the amount of time your muscles are directly under the pressure of your chosen weight load. In other words, only time is counted and not the number of repetitions done on any given movement. As you would have seen in the video, watching someone perform this type of exercise, is as boring as watching grass grow and does not seem very challenging – the experience however, is quite the opposite. Each movement will last between ninety seconds and two minutes, this is all the time it takes to entirely fatigue a particular muscle group, before moving on to the next movement and the entire workout session is always completed in less than fifteen minutes. For the first minute or so, you generally feel pretty good and strong. As you go past the one minute mark, the experience starts to change very rapidly, your muscles are starting to feel on fire and your breathing is getting heavier as if you are running at a good pace. 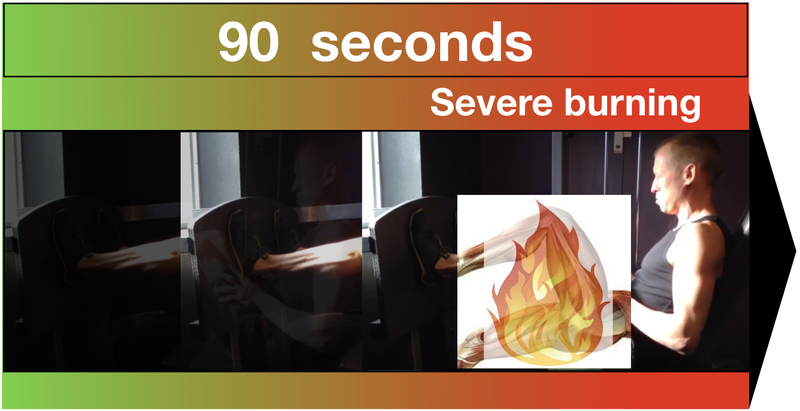 At ninety seconds or so, the discomfort level takes another notch upwards, in the form of feeling a severe burning sensation in your muscles…only at this stage, may your body start activating the fight or flight response. Somewhere between ninety seconds and two minutes, you will be puffing as if you’re sprinting flat out, complete fatigue will occur and you will be unable to move the resistance any further. At this point, your body has received the message, that more strength was needed to overcome the ‘threat’ you were just exposed to. In other words, a stimulus to build and maintain muscle tissue has just come upon your body. In my former pursuit as a distance runner, I would often train by attaching and dragging a car tire behind behind me. My thought was, that by adding resistance to my running, I would be able to run faster, once it was taken away. Even though, I became a half decent runner using this type of approach, I am now of the opinion, that it might have happened in spite of my tire dragging and not because of it. Any high level runner, will tell you how important it is to learn proper technique in order to become better and more efficient as a runner. In other words, the skill of running is the most important. This is why running coaches will observe their athletes and make changes to their stride length and body positioning in order to improve. Refining your running skill down to a very precise and fine art, is done through practicing and continually correcting yourself while you train. The problem with adding resistance, like dragging a tire, to a finely tuned running style, is that your technique changes to accommodate the drag. For instance, I would find myself leaning further forward, taking much shorter strides and not be able to take advantage of the natural spring from my tendons, which otherwise occurs naturally when you run free. While the tire training obviously did condition my muscles, it most likely scrambled the precision of my technique and skill in a detrimental way. Metabolic Performance Exercise is the conditioning part of becoming competent at any type of physical activity. By focusing entirely on conditioning, it can be made very effective as with Safe Continues Muscle Loading. The idea behind continues loading of the muscles is to eliminate all momentum and make it as challenging as possible, in order to maximise the stimulus to the muscle group being worked. In essence, conditioning is the complete opposite to skill training, where the focus is to use as much momentum as possible in order to do something easily. A example of pure skill training is kicking up into a handstand and then balancing on your hands. By using the momentum from swinging one leg upwards, while at the same time pushing slightly off the ground with the other, the kick up itself requires very little muscular effort. Once in the top position, arms are locked out, to create a ‘bone on bone tower’, rather than relying entirely on the arm muscles to keep your arms straight. It obviously takes a certain amount of strength to hold yourself in position, but compared to developing timing in the kick up and finding your balance, this is very minimal. Well conditioned muscle tissue will assist your body, by providing a good base of strength, which can easily be molded and adapted into any physical skill based activity you want to do. In my other profession as a trackwork rider of racehorses, adapting to the requirements of the job from a good base of strength has served me well and continues to do so on a daily basis. In my humble opinion, what we need to comprehend is that combining the practice of a specif skill with trying to gain strength, is fundamentally ineffective at best and most likely detrimental at worst, to both skill improvement and strength gain. As mentioned earlier, effective conditioning of the muscles requires the elimination of momentum, while improving a skill relies on the effective utilisation of momentum, therefore it’s almost impossible to combine the two forms of training in one movement to improve both. If I was to put on ankle weights, while practicing a hand stand kick up, with the intention of obtaining a better kick up once the weights came off, I would probably just ruin my overall handstand skill, nor receive any improvement of muscle strength, as momentum would be used to kick the weight up. I am much better off by strengthening my muscles through proper conditioning and then allowing that strength to be molded and adapted during hand stand skill training. If we try to combine skill and conditioning in one movement to obtain the best of both worlds – we will in all likelihood end up with neither. However, if we separate the two, they will come together naturally and effectively. Credit must be given, where credit is due! By no means, do I want to claim, that the information on exercise presented on this page, has arisen from my own original thinking and ideas. I have merely taken advantage of the knowledge, which others have discovered long before I was even born. In my blog post From FAT distance runner to LEAN minimalist exerciser, I bring great attention to the work of Dr Doug McGuff. He is a co author of the book Body by Science and the person who’s work I follow most closely in the realm of exercise. In the following 49 min interview, Doug gives a very good concise explanation of why brief and intense exercise works the way it does, enjoy.